FlyingFiber’s GYHTY non-metallic strength member cable provide 250μm fibers, are positioned in a loose tube made of a high modulus plastic. The tubes are filled with a water-resistant filling compound. A Fiber Reinforced Plastic (FRP) locates in the center of core as a non-metallic strength member. The tubes (and fillers) are stranded around the strength member into a compact and circular core. 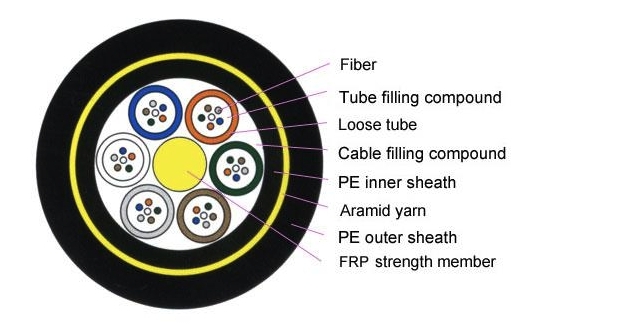 After the cable core is filled with filling compound, it is covered with thin PE (polyethylene) inner sheath. Then, a layer of aramid yarn is applied as additional strength member and the cable is completed with a polyethylene (PE) outer sheath. 1). Good mechanical and temperature performance. 2). Aramid yarn strength member ensures good performance of tensile strength. 3). High strength loose tube that is hydrolysis resistant. 4). Special tube filling compound ensure a critical protection of fiber. 5). Crush resistance and flexibility. – Single Fiber Reinforced Plastic as the central strength member. – Loose tube filling compound. – 100% cable core filling. 7). 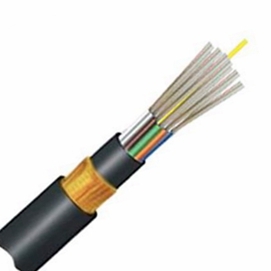 GYHTY cable complies with Standard YD/T 901-2001as well as IEC 60794-1.